I was primarily using a 10-17mm Fisheye lens due to the large field of view it provides. The nice thing about using a wide angle lens in astrophotography as it’s quite east to avoid having stars blur due to the Earth’s rotation. Eventually I plan on trying my newer rectilinear 14mm prime instead of the 10-17mm Fisheye. 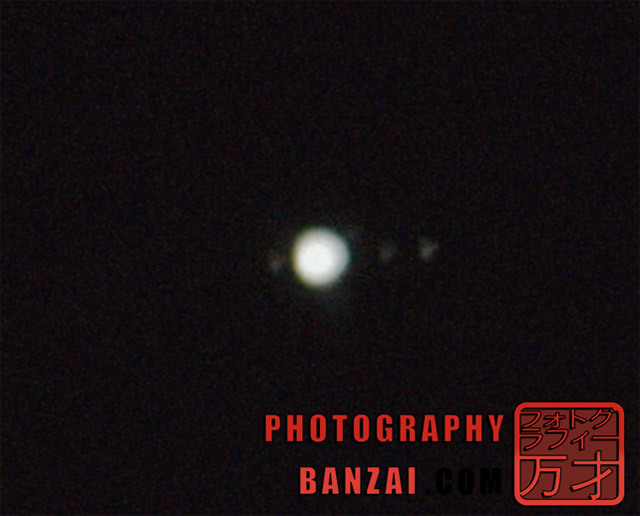 Seeing as I didn’t have much time I’ll use that as an excuse for blowing Jupiter to completely white. Due to how the telescope is mounted the massive focal length it must be, the exposures I was taking were much too slow for Jupiter itself. 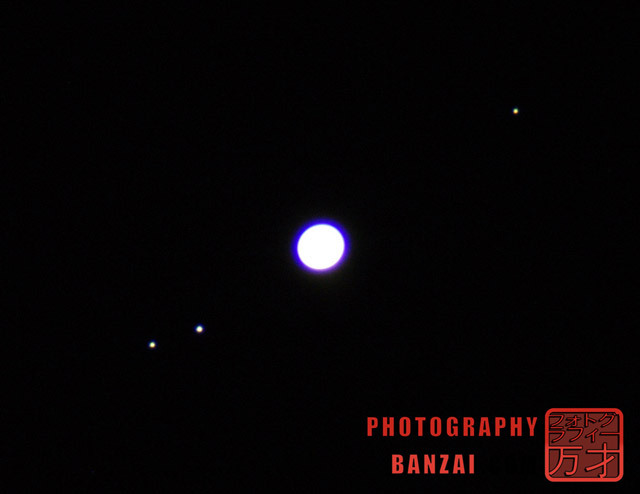 The moons faired better though, so I think it would have been best to take multiple exposures and piece them together. In the photo I have a Slik Pro 700DX AMT-alloy tripod. I’ve had a fondness for Slik as they have nice quality products for a reasonable price. 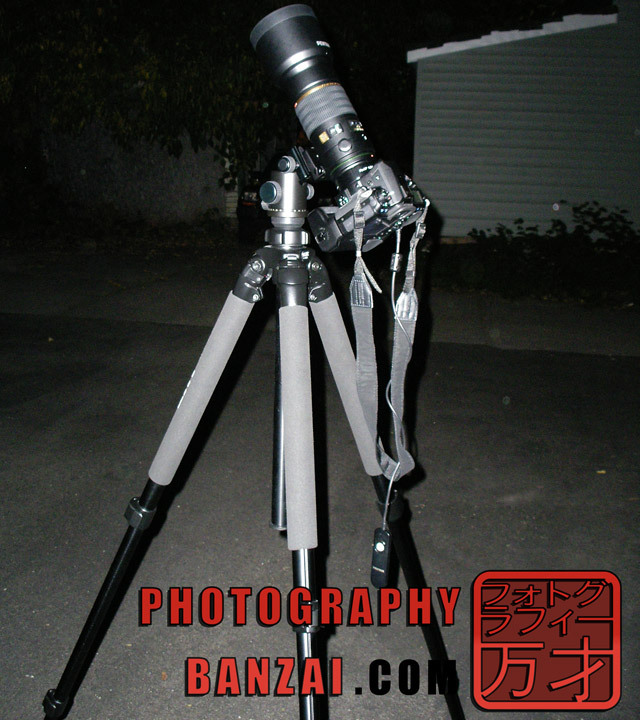 While this tripod isn’t the lightest thing weight wise at 7.05 lb, it extends to 74.8 in., it can support 15 lb, and the main column can be shortened or completely flipped the the mount end is between the tripod legs (good for macro photography). A negative would be that the type of material used is more prone to vibration than more advanced materials like carbon fiber. As for the ball head I own a Smith-Victor BH5 with a 26 lb capacity, which is another good value conscious product. I took 5 bracketed frames and pieced them together with 5 dark frames in Photoshop CS2 by hand. While it doesn’t look like much it’s a lot more detail than the human eye can see. This a a large crop with quite a bit of Photoshop work in curves, noise reduction, and adding some sharpness due to losing definition after merging the images together. I’m not really sure the 5 images were much better than a single properly exposed one, but I have a feeling there is quite a bit more dynamic range in this image than I could have managed in a single one. This entry was posted in Article and tagged astronomy, astrophotography, examples, experiment, long exposure, stars, wide angle. Bookmark the permalink.